This is article is about diesel locomotives built 1958-1960. For 2007-era locomotives, see Vossloh G1206. 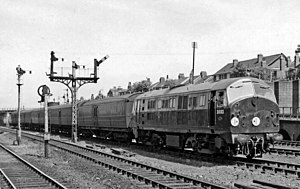 The British Rail Class 21, originally known as the North British Type 2 diesel-electric, was a type of diesel locomotive built by the North British Locomotive Company in Glasgow for British Railways in 1958-1960. Starting in 2007, the classification has been reused for new Vossloh G1206 acquired by Euro Cargo Rail/EWS. This page was last changed on 23 July 2018, at 13:16.